content was ready for the 37th issue of Showcase (Mar-Apr 1962), the DC Comics title where new concepts were tried out before being given series of their own — and the issue was due at the printer in two weeks. Writer-editor Robert Kanigher created a band of adventuring robots and scripted a story for them over a single weekend, and handed it to a pair of speed demon artists, penciller Ross Andru and inker Mike Esposito, the team that had been drawing Wonder Woman and The War that Time Forgot under Kanigher's editorship for several years. They made their deadline with days to spare. Since Kanigher never expected there to be a second Metal Men story, he killed them off at the end. But even as rushed as the concept was, the characters were deemed to have a chance of success, and were pencilled in for the next three issues of Showcase. So #38 opened with the robots' creator, Dr. Will Magnus, salvaging their parts — especially the all-important "responsometers" that gave them life — and forging a new set of Metal Men identical to the first. Death at the end of each adventure, followed by resurrection at the start of the next, was a schtick of theirs for years, one of The Metal Men's endearing trademarks. There were six Metal Men, made of six different metals: Iron, Gold, Lead, Tin, Mercury and Platinum. Each had the metal's physical characteristics, and personal traits to match. For example, Iron was strong and dependable but not very flexible, Lead was solid but not very firm and not very bright, and Mercury was — well, mercurial. Platinum was bright and beautiful, like the metal, and cast in a female shape. Because of a faulty responsometer, she thought of herself as a real woman, and was in love with Doc Magnus. Most had no names other than their metals, but Platinum called herself Tina. The Metal Men surprised everyone at DC by proving popular enough to get their own bimonthly comic, the first issue of which was cover dated Apr-May 1963. In addition to an exciting (but usually rather oddball) adventure starring an appealingly diverse set of personalities, each issue was like a chemistry lesson. Recurring villains included Chemo, who could field a wide variety of destructive chemicals, and The Gas Gang, a bunch with powers analogous to The Metal Men's own. The comic was never a blockbuster best-seller, but it succeeded well enough to last out most of the 1960s. Eventually, however, it ran out of steam. With its 41st issue (Dec-Jan 1969-70), it was cancelled. It was revived in 1976, and ran another dozen bimonthly issues. Since then, there have been a few specials, guest appearances, mini-series, etc. keeping them around. 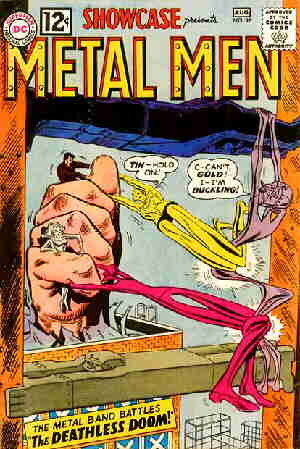 Like many minor characters, no longer able to sustain comics of their own on a regular basis, The Metal Men have been handled in widely different ways by different writer/artist teams. A recent one purports to explain why their responsometers give them such human-like personalities, and why attempts to outfit them with new responsometers always made them cold and — well, robot-like. It seems they've somehow latched onto the personality patterns of recently-dead humans. In keeping with that theme, Doc Magnus himself was killed off and replaced with a robotic simulacrum. He is now Veridium, a metal which seems to have no exact counterpart in the real world. Tina, needless to say, sees this as a fine state of affairs. At last — she has a chance! Text ©2000-02 Donald D. Markstein. Art © DC Comics.